The 2017 Sandoz HACk winners have been clearing entrepreneurial hurdles to overcome barriers to healthcare access in their countries. Using digital technology, they are moving from pitching their ideas to providing better patient care. The 2017 Sandoz Healthcare Access Challenge (HACk) was a global competition that invited inspirational ideas with the potential to complement – or even disrupt – established approaches to healthcare access. It was a contest marked by collaboration and camaraderie. United by their passion to improve healthcare access, six finalist teams embraced the spirit of working together. Today, 18 months after the awards ceremony, the three winners have cleared many entrepreneurial hurdles, and they now have pilot programs or prototypes up and running. Still, they continue striving to overcome barriers to healthcare in their countries – Ghana, the Maldives and the Philippines – which exist due to lack of healthcare capacity, medical knowledge and geographic distance. But they are more determined than ever to see their ideas turn into reality . With each step, the HACk community has been at their side, encouraging and supporting. Let’s catch-up on what’s been happening with the winners as they moved from pitching to providing patient care. 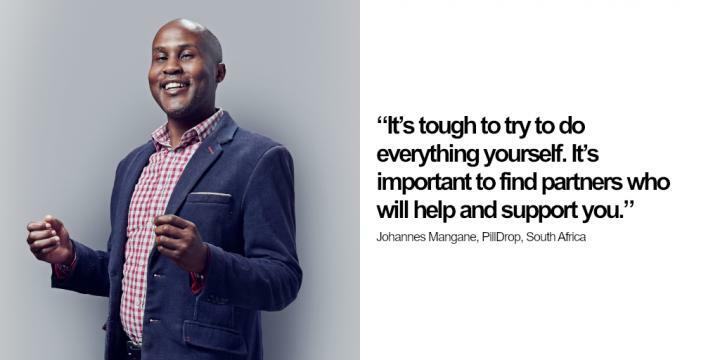 Improving access to medical information is at the heart of Elvin Blankson’s GoPharma project. Currently his app pilot is live in about two dozen locations in Ghana, and the team is testing functionality through the mobile messenger service WhatsApp. The results of his pilot study with medical counter technicians, the app’s intended users, have demonstrated just how great the need is for medical information in his country. Elvin, himself a pharmacist and pragmatic problem-solver, explains that Ghanaians who stop by a pharmacy want both access to medicine and to quality medical advice. At the same time, medical counter technicians want to be able to provide such counseling themselves. “No matter their level of training, they want to learn more,” says Elvin. To meet this need, twice a week the GoPharma team sends out case study exercises that improve and test technicians’ knowledge. The team, which includes Priscilla Adu-Darko and Lebene Soga, hope the app can one day provide mentoring from physicians as well. In the meantime, GoPharma is progressing in leaps and bounds, and Elvin is in talks with the country’s pharmacy council about expanding the pilot and scaling up the project. “Going forward, we intend to recruit 50 to 70 pharmacists to serve between 1,000 and 2,000 medical counters.” His next step is focusing on raising funds so that he can ultimately reach his goal of connecting all of the country’s 4,000 pharmacists, who can then provide access to quality advice to some 20,000 medical counters. Motivated by Thalassemia’s urgency – its patients regularly need blood donations to survive – software developer Mohamed Shuraih is happy to report that he has a basic functioning product. Many technical aspects of the Blood Drive app – including user features and a methodology for an incentive system – are well underway, he adds. However, local Thalassemia centers still maintain their blood donor registers, along with records of blood types, on paper lists, he says. So Shuraih – using last names is common in the Maldives - has also created a basic database to connect this decentralized information, and he is working on guidelines for accessing and using it. During a mentoring call with all HACk finalists, Sandoz CEO Richard Francis agreed that – particularly for an individual entrepreneur – working with a range of stakeholders, including national governments, charities and non-governmental organizations is essential when everyone is working towards the same common goal – improving access to healthcare. Guidance on how to make his idea a sustainable business has been very useful, says Shuraih. “Some potential partners are keen on sponsorship rather than direct funding,” says Shuraih. “So it has been a tough road figuring out how to monetize the application.” Despite the hurdles, he shows no signs of slowing down. Quite the contrary: Shuraih says the various inputs are helping him to make his BloodDrive app better, and he remains confident that any stumbling blocks can be cleared. Developing an app is also a complex task. Programming has taken longer than expected, he admits. “At the start we were very high after winning the Sandoz HACk and tried to do everything ourselves, but this got us behind schedule.” With support from the local Sandoz office in the Philippines, including marketing and contact with IT developers, Sali is back on track. In fact, a few schools are already working with the Sali app for giving basic life support training based on audio and video instruction, Joel explains. With a goal of 500,000 downloads, the Sali team hopes to promote the CPR app through events to more broadly educate people about saving lives, in combination with healthy lifestyles, or with medical students. With the help of social media, they hope to build an online Sali community, as well as on-site groups on various Philippine islands. Growing the HACk community is one of the aims heading into the 2018 competition. Because the winners’ dedication has been turbo-charged by new experiences, the young entrepreneurs are eagerly waiting to share their enthusiasm. “We want to tap into their knowledge, time and energy to support the new HACk generation,” says Fiona Cook, Manager Corporate Responsibility Strategy, who organizes the global Sandoz HACk competition. “We have adapted the MedMee project,” says Saif Ali, “simplifying it to focus on making it easy for patients to research medicines and get these delivered.” The team has tested a prototype and is improving it through user feedback. 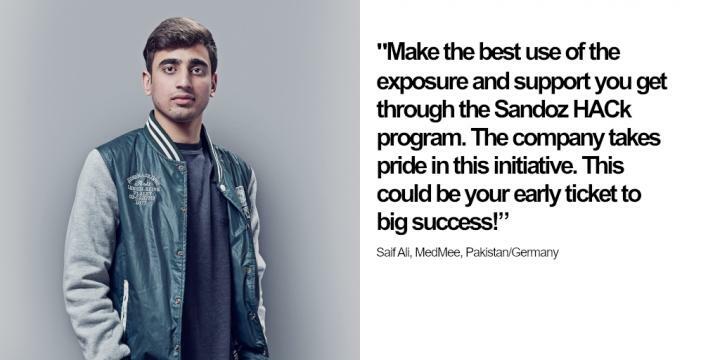 Because he believes Europe offers better market potential for his concept, Saif has moved to Germany. He says he is eager to contribute to the Sandoz HACk community. The evolving need to integrate refugees coming into Germany led Benedikt Schmidl and Tanja Schwarzmeier to develop SALMON, an app to help with the diagnosis of PTSD and depression. “Among refugees and asylum seekers, PTSD and depression are the main psychological disorders,” explains Tanja. “Some 80 percent suffer from these conditions. Yet most of them have no access to psychological counseling.” Aided by local endorsement from Sandoz, the team hopes to add IT experts and psychologists to their project.